The Rangely Campus Library is centrally-located in the lower level of the McLaughlin Building. 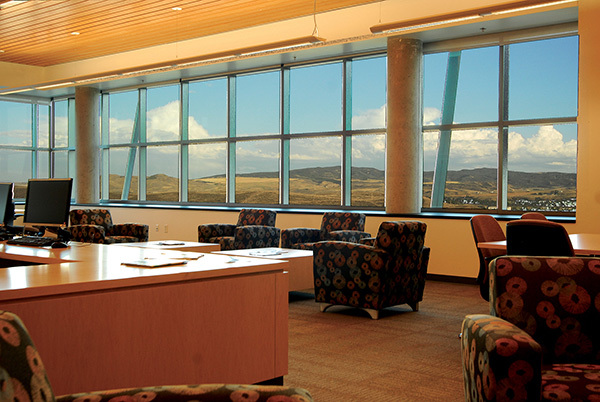 The Library provides a great environment for studying, as well as access to services and resources that help students achieve their educational, workplace and personal goals. More than 23,000 print books, over 7,500 electronic books, 105 print periodicals and growing collections of Audiobooks, DVD’s, Music CDs, and Video games (PS2, PS3, XBox, XBox360 and Wii). The Craig Campus features a "Virtual Library," designed for the growing trend toward paperless, technology-driven resources. A full range of online resources are available to students in every discipline. 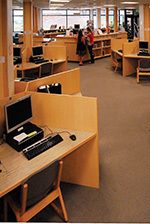 Students can use their wireless personal portable devices or use one of the four computer stations in the library. The room features a commanding view of the Yampa Valley, and a quiet comfortable environment for study.